How can you quickly become known as the go-to authority in your field? You could hire a celebrity publicist, sign a six-figure book deal, or make a few simple tweaks to your website. People pretend that superficial things like web design don’t matter, but trust me, a polished site can seal the deal with web visitors. Now enough hype. Here are ten tactical ways you can tweak your website today to position yourself as the top dog in your field. Have you ever been quoted at a newspaper, spoken at an event, or won an award? Put their logo (with permission of course) right on your homepage. People connect logos and prestige instantly, and the funny thing is, the logos don’t even need to be that important. Figure 1. See how I feature logos on my home page? Now, your logo doesn’t have to cost $5,000 or even include any graphics. Instead, it can just be your business name in a more distinct font/color scheme. As an example, refer back to Figure 1 above to see how I stylize my name on my site. Short, impactful testimonials get your customers excited about your work AND prove that they aren’t the first one to hire you! The quotes collection plugin was meant for quotes, but it can be used to rotate testimonials in any widget-ized section of your site, too. What if you don’t have any testimonials? Where can you get them? Twitter and Facebook. Just start using the nice things people say about you and your business as testimonials for your website. This works because these mini-testimonials have a name and picture associated with each comment and that helps build trust. As your website evolves, it’s easy to let little things slip by the wayside. While perusing my site, I discovered an old opt-in form from a past event that was no longer delivering the content it promised. It may seem small, but to the person who opted in, I didn’t deliver and I could have lost their trust forever. Get a system in place for continuously checking links, autoresponders, and old pages to make sure everything is still up-to-date and in working order. Check out this broken link checker plugin to help you get the job done. A favicon is the term for that little icon that shows up next to a website’s title at the top of your browser’s window, or in the tab that you’re browsing. Creating a custom favicon that matches your branding is one of those tiny tweaks that divides the boys from the men. Sure, it’s subtle, but it really adds polish to your web presence. In the latest version of Thesis (1.8), there’s a built-in favicon uploader which makes it a snap to add a favicon to your Thesis WordPress site. Did you think you were being clever by listing your keyword 50 times on the bottom of your site? We can all see it and it looks like a hot mess! Always write for humans first and search engines second. SEO gobbledygook anywhere on your site looks like a desperate ploy for a better ranking – which is not something someone who is already at the top needs to do. Instead, use the built-in SEO features in Thesis to optimize your site for search. If you don’t have Thesis, the All In One SEO Pack plugin works too. If you want to position yourself as an authority, you want your site to promote YOU, not other people. It’s tempting to fill your sidebar with badges like “I’m a Super Cool Blogger 2009,” ads, buttons, and various other widgets, but they lead people away. Plus, it makes you look like a newbie blogger, not a professional. Beside being unprofessional, freebie websites build up SEO juice for the company that hosts your site, not yourself. This goes for your email address as well – use your domain name in your email address and get professional, consistent email addresses for everyone in your company. 9. Spring for a Designer Already! Just one hour with a web designer can take your site from mundane to marvelous. When people think of web design they usually assume a 6-month project that takes thousands of dollars is coming, but it doesn’t have to be that way. Most designers are more than happy to be hired for just one hour to tweak your site, or create a header graphic for you for a few hundred bucks. Browse through the Thesis Designer Directory to find someone who fits your style. This small expense has a big payoff in positioning yourself as #1 in your field. Yes, we all know this one, but have you actually done it? Your entire site should be scoured top to bottom by at least three people, or a professional copy editor. Or cheat a little bit by using the “After The Deadline” plugin, which uses artificial intelligence to check the style, spelling and grammar of all your posts and pages. Small mistakes can be a huge turn-off to a prospect. After all, if you can’t get it together for your own site how can you be expected to provide top quality to your customers? Implementing just one of these ten tactics can greatly bump up your reputation in your prospect’s eyes. If you’d like additional help, you should join my new course Creating Fame. It’s a step-by-step guide to making you and your business famous using social media. Note, enrollment is currently open for a limited time until Tuesday, October 12, 2010. 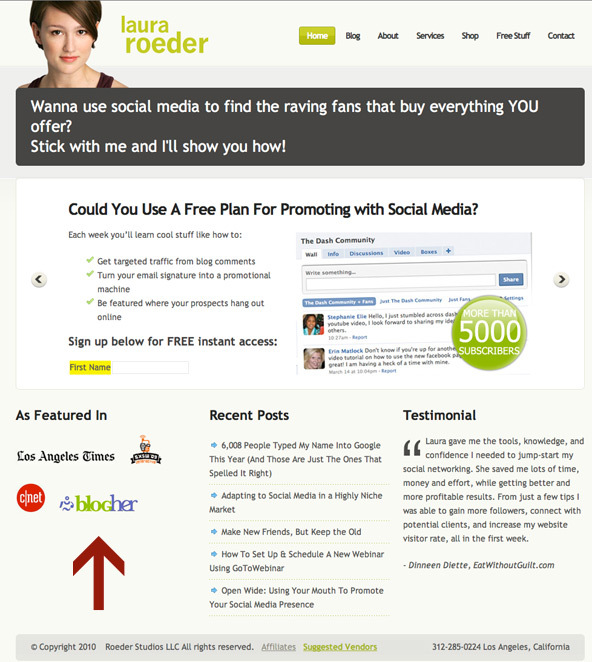 About the author: Laura Roeder is a social media marketing expert who teaches small businesses how to create their own fame and claim their brand online. She lives in Venice Beach, California, where she video blogs, makes frequent trips to the library, and volunteers with local middle schoolers.